Phone system includes a base station with a digital answering system and handsets. 4 handsets are included, but you can connect up to 6 (additional handsets are sold separately). 3-way conferencing makes it easy to collaborate with colleagues and clients. Digital answering system makes it easy to track calls while you're out. 1.6 inch amber LED is bright and clear. Call waiting/caller ID capability makes it easy to see who's calling. Call waiting/caller ID service required from your local telephone company. Speakerphone lets you chat hands free alone or in meetings. Stores up to 50 phone numbers. Wall mountable to help conserve desk space in your office. 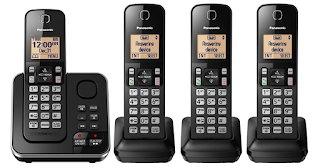 Handsets provide up to 9 hours of talk time and 4 days of standby time. Battery life will vary depending on the product configuration, product model, applications loaded on the product, power management setting of the product, and the product features used by the customer. As with all batteries, the maximum capacity of this battery will decrease with time and usage.